38-year-old Jone Liu, from Matuku in Lau achieved what is today is his “green 10 acre gold mine. A little motivation goes a long way and what better motivation is there, than one’s own family and the vision of the possibilities that could be realised through hard work and determination. That is exactly how 38-year-old Jone Liu, from Matuku in Lau achieved what is today is his “green 10 acre gold mine”. 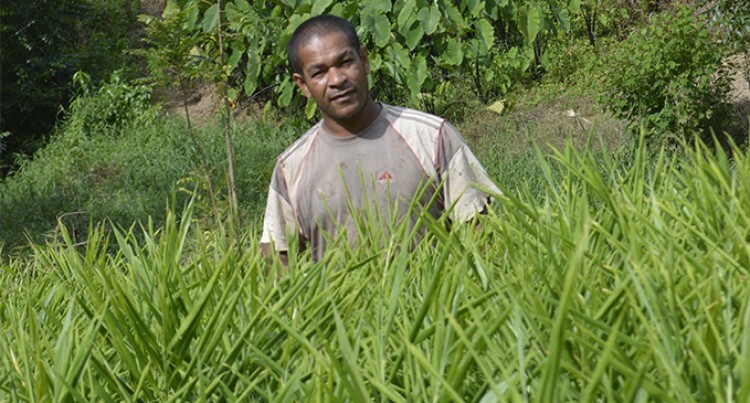 Through experience, he has grown his 10 acre farm situated at Waibau, Naitasiri into what it is today, a sea of green leafy assorted vegetables, dalo and ginger. Ironically enough, it all eventuated after he was inspired by seeing how his Chinese farming neighbours were striving well on their own farm and it was this evaluation that led Mr Liu to put in the extra effort to plough and toil the land, with the vision to one day surpass them. “I always admired them, how they sacrificed and relied only on their abilities, moving from semi-commercial to commercial and further opening businesses in the city and I thought to myself, if they can, then so can I,” he affirmed. The farm, where he and his young family also reside, is a scene of farming discipline, neatly aligned rows of dalo and vegetables outline its outskirts with his ginger being hard to miss, all bearing testament to Mr Liu’s sweat and determined effort to make the most out of his land. He said that he planted and supplied according to the fluctuating demands of the market and prices. “At one stage when tausala prices was high and in demand, I fully concentrated on dalo and because ginger prices were fluctuating and the market was uncertain, I decided to let it rest for a while,” he said. Soon after, the supply and demand margin of dalo dropped resulting in Mr Liu balancing his farm produce between dalo and ginger. “I knew I couldn’t be choosy if I want to feed my family and put my children through school, so I took up ginger again. “It’s always good that we experience these kinds of challenges as it enables us to continue and evaluate demand and supply,” he said. In 2008, upon the advice of the Ministry of Agriculture, he became a part of the Bureni Ginger Farmers group and was assisted along with his fellow group members on land preparation under the Ministry’s Rural and Outer Islands (ROI) Programme. “I am thankful for the assistance, it was easier when it is done in clusters and from it I managed to plant my dalo and ginger as machine and labour is a problem and I can say that the assistance proved fruitful,” said Jone. At present, three acres is used for ginger whereby his last harvest produced more than 17 tonnes, with 6,000 dalo suckers on the ground with 0.15 acres dedicated to assorted vegetables. In recognition of his hard-work, he scooped the Progressive Young Farmer of the Year award during the first national Agriculture Show. “The award was given at the time when I was farming as a youth on two pieces of land and supply was consistent and my production met the demand,” he said. In 2017 he was once again encouraged to continue cultivating ginger because of his farms soil type and his enthusiasm to take up the task proved advantageous. “I decided to give it a go once again despite its many requirements, the Ministry assisted me with two tonnes of ginger seed while I had three tonnes, so a total of five tonnes planted and I harvested 163kg in March this year,” he said with a grin. “Ginger is a seasonal crop and while cultivating it, we really need to concentrate, although a fast cash crop, it’s also time consuming. “All we need is to focus if we want higher yields as their growth depends on its maintenance,” he said. “The assistance has driven me forward with not only my farming but through the revenue collected, we have managed to extend the house which once belonged to a Chinese family whom we bought the farm from,” he said. Mr Liu recounts his past experiences recalling that the nature of farming, teaches valuable lessons to farmers, as there were unforeseen circumstances awaiting him. “I’ve experienced a number of challenges as a farmer – there are many of risks faced by farmers and this ranges from droughts, hurricanes and the unfavorable commodity prices,” he said. He supplies his dalo to Sai Yee Food Ltd for $1.50-$3.00 per kg while his harvested ginger is supplied to Frespac Ginger (Fiji) Limited. To supplement his established supply chain, the family have a table reserved at the Nausori Market for his wife to sell other produce for public consumption, raking an additional $300 gross weekly income. “It all comes down to being passionate about farming and having the urge to continue when obstacles come your way and with that comes the consistency in supply because once there is lack in consistency, harvest and supply will also be affected,” Mr Liu said.He continuously promotes farming to youth as a source of income and a career, stating that there is no shame in contributing towards feeding the nation as a dedicated full time farmer. “I want to assure unemployed youths, farming is nothing to be ashamed of, you are actually contributing to the health of the nation while at the same time generating income for yourselves and for your family, we need young motivated farmers today. His will to succeed for his family and their future coupled with the self-belief that anything and everything could be achieved through sacrifice and devotion should be motivation enough for any young farmer. It is this same motivation that he speaks of that led him into becoming the respected farmer and man that he is today, because like him, everyone needs a little extra motivation in their life every now and then.